Did you know there were water riots in Bolivia in early 2000? Poor urban Bolivians actually took to the streets over water… not because there wasn’t enough to go around but because the American construction and engineering firm Bechtel had taken over the country’s privatized water infrastructure, including — and here’s the really insidious, practically downright evil part — rainwater. A multibillion-dollar corporation was telling poor people that they were forbidden to collect rainwater, that they must buy water — at hideously jacked-up prices, of course — from Bechtel. But you don’t hear about situations like these from major media because they, too, are owned and managed by multibillion-dollar corporations who have priorities other than your state of informedness in mind: namely, money. 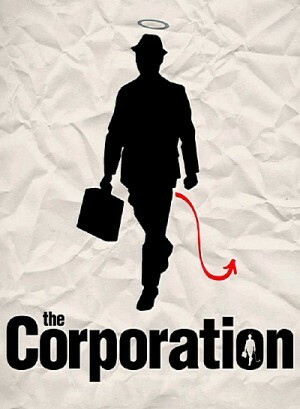 The dominance of “the corporation” as the all-pervasive driving force of our economy and even of our culture is the terrifying subject of this, Jennifer Abbott, Mark Achbar, and Joel Bakan’s angry, bitter, but frequently funny, funky, and mesmerizing in-your-face documentary.